West Coast Swing Youtube – Keeping things in perspective. Are you a west coast swing youtube junkie? Have you seen this video? Take a minute to watch Robert Royston and Trendylon Veal’s J&J finals dance at MADjam. It’s great WCS, it’s musical, and it’s unbelievably entertaining.Its an amazing video but there is more to be learned than meets the eye…. Dances like this are brilliant. But, it’s also important to recognize that it’s a unique magic moment, and really really good unchoreographed dances won’t always have that moment. In a lot of ways, our expectations for unchoreographed dancing are distorted because we only see the jaw-dropping ones on YouTube. How many dances does a pro have over a weekend? Let’s say 100. How many of those dances end up on video, either because they were on the event DVD or someone was recording a social dance? Maybe 10. And how many of those get posted to YouTube? If that pro had a truly magical dance, they might have one posted from that weekend, but it’s common to have weekends with zero videos that get uploaded. So, if you are watching a video of a pro on YouTube, you are watching a dance that was, at most, a once-in-a-hundred moment. The videos that get thousands of views of YouTube have yet another layer of exclusivity. The point is that YouTube dances are anything but typical. They are so exceptional that you’d have to watch a hundred dances by that pro in order to see something magical like that again. But on YouTube, you are only seeing those one-in-a-hundred dances, and so you begin to think that every pro dance is mind-blowingly magical. The point isn’t to take anything away from Robert and Trendylon—if anything, it’s the opposite. The lesson is that you should recognize that a dance with magic moments like this is very atypical, even among the champion level of dancers. Many dancers try to force this kind of dance in their competitions or social dancing, and they end up looking out of control, making their partner uncomfortable, or just being frustrated. These magic moments can’t be forced. If they happen, by all means enjoy the ride. But if they don’t, you can still have a great dance. Determined to learn west coast swing on Youtube? I often encourage west coast swing youtube fanatics to be inspired by what they see on youtube but not learn from those videos. There are so many things left out when trying to learn from a full speed videos of a professional dance performing a move. The best source for online video learning is this website. You can even>> try it free! 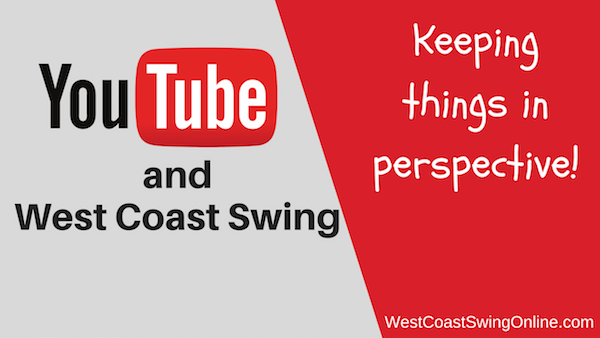 If you really are a west coast swing youtube fan then try the west coast swing online youtube channel. It contains great information (not as good as our website 😉 but the best on youtube! Hey! I want to give you something FREE….